To activate this feature go to Profile Builder -> Settings -> Private Website tab and select Yes for the “Enable Private Website” dropdown, then click Save Changes. Once activated the entire website, including RSS Feeds and the REST API, will be available only to logged in users. This setting allows you to choose where the visitor redirects to if not logged in. The default setting for this is the wp-login.php page and the other options in the dropdown are all the published pages of your website. If you switch from the default we recommend the selected page contains the [wppb-login] shortcode. 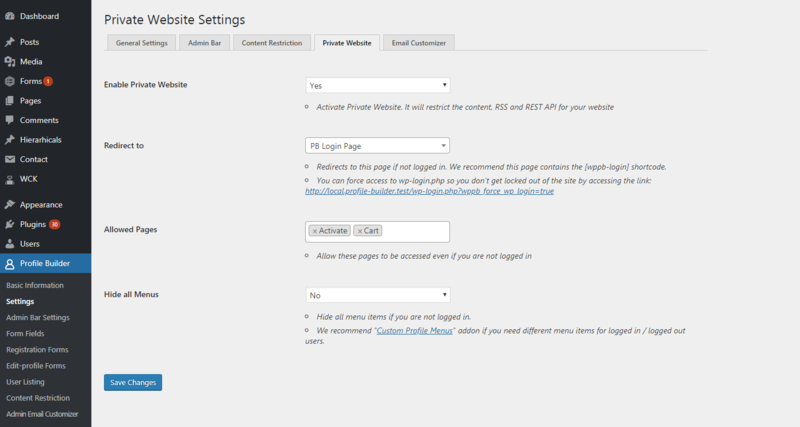 With this setting you can choose pages from your website that are still accessible even if the visitor is not logged in. A useful example would be a Register Page. With this option you can select to hide all menu items if you are not logged in. This is useful if you don;t want any other links to appear on the frontend login page you selected. If you need different menu items for logged in / logged out users we recommend the Custom Profile Menus add-on.